Rosemary Beach is inevitably compared to Seaside. Not only do these two developments share the same stretch of Florida Panhandle coast but they were also designed by the same architectural firm, Duany Plater-Zyberk & Company. Seaside debuted two decades ago as an architecturally groundbreaking community in the forefront of a movement called "New Urbanism," and Rosemary Beach followed its lead. Both are modeled on the traditional small town and thus have a shop-lined main street at the village core and mostly single-family houses dispersed through residential neighborhoods laid out around village greens, parks, playgrounds, and swimming pools. Whereas Seaside took New England as its model, Rosemary Beach draws its architectural inspiration from a variety of influences, including Florida's historic St. Augustine, the Dutch West Indies, Bermuda, and New Orleans and its palette from the native vegetation. True masonry stucco and wood (stained not painted) predominate because these are materials that stand up best to salt, sun, and cold winters, and porches abound. The guidelines allow enough variation that no two houses look alike, even as they share a substantial number of basic architectural features and one of nine structural types. Real towns, of course, never look this good. Yet the decision to use native plants—rather than the cliched exotic palms, oleander, and hibiscus—goes a long way toward softening that artificiality. The houses and boardwalks are bordered not by lawns but by a xeriscape drawn from such local species as Yaupon holly, saw palmetto, sand live oak, lavender-blossomed local rosemary, goldenrod, and native grasses. The only lawns are in a park along Hwy. 30A and in two strategically placed village greens just behind the dunes. Rosemary Beach is the new kid on the strand. Begun in 1995, it has come together at a fast-forward pace. The 107-acre parcel begins along 2,300 feet of Gulf-front beach and extends inland across Hwy. 30A, which divides it into two roughly equal sections. A winsome Town Hall in white stucco with a Dutch West Indies parapet roof anchors its village core, which contains several shops, a couple of restaurants, an 8-room Italian-style bed-and-breakfast called The Pensione, a day spa, and sales and rental offices. Just beyond the Town Hall ground construction is underway on an inn. Boardwalks over the dunes provide access at nine points along the Gulf (two of them have wheelchair ramps as well as stairs). As elsewhere along this corridor, the beach is a broad apron of white sand bordered by a sea the color of emeralds; however, to the east and west of the property, houses and condos rise at the very back edge of the dunes. Rosemary Beach, however, opted to leave a buffer of sand and native vegetation between the seaward property line and the dunes. With all the houses set back, I could walk along the beach without any sense that an entire village lay just beyond those 30-foot dunes. Interspersed among the houses are swimming pools, playgrounds, and a racquet club with eight clay tennis courts. One of the local residents offers bicycles for rent and watersports equipment for rent. But even though all the houses are individually owned, fewer than 30 percent of them are expected to have year-round residents. Most are second homes, many of which are available to rent when the owners are away. They range from cozy studio carriage houses to palatial five-bedroom homes. The Rosemary Beach website lets you see exactly what you'll get before you rent. Happily, in developing the property Rosemary Beach chose to make tennis a focus of available activities. Its club has eight Har-Tru courts—six with lights—anchored by an attractive pro shop with a rooftop seating area and deck. Immediately adjacent stands the Rosemary Beach Fitness Center as well as an indoor/outdoor swimming pool. Tennis Staff. USPTA pro Mike Clark took over the tennis operation in April 2001. 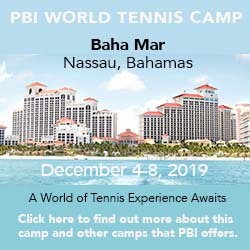 He has more than 25 years of teaching experience and has spent 19 years as a Tennis Director for various clubs and resorts, running many USTA events and recreational programs. Head Professional Jonathan Clark played Division 1 tennis for the University of North Carolina at Charlotte and is in his 7th year with club. Tennis Programs. The basic program year-round daily clinics for adults and spring, summer, and fall clinics for juniors. From August through May, the club offers a "Dynamic Doubles Package" for groups of four or more. Courts & Fees. the racquet club has 8 Har-Tru courts, 6 with lights, laid out in pairs. Court fees: Complimentary for guests who rent through the Cottage Rental Company. Golf Courses. There is a three-hole practice course. Fitness Center. The tennis clubhouse has a tiny fitness room housing a couple of cardio stations and half a dozen ProFormance exercise stations. And ... There is a kids' playground outfitted with a treehouse, swings and slides, a sandbox, and jungle gym. Stables just outside the property provide the option of horseback riding into the desert hills beyond. There are organized children's programs over busy weekends and holidays. The cottages, which range in size from studios to one bedroom, none taller and a single story and all scattered through a desert landscape along streets without names. These can be combined to create suites as large as five bedrooms. Most have wood-burning fireplaces, flat-screen TVs, DVD players, Internet access, patios, wet bars or kitchenettes, patio and lawn areas, and complimentary parking. The Ranch House Dining Room, furnished with hickory chairs, is the focal point of much of the ranch's socializing, and thus many guests opt for a Full American Plan and take all their meals there. The atmosphere is informal—to the point that guests pass through the kitchen to pick up their evening meal—though by tradition men as asked to don jackets on Friday and Saturday evenings. Guests can dine indoors beneath a beam ceiling or outdoors beside a rock fire pit. Rental units range in size from studios to 5 bedroom homes. Each is different. Their web site lets you see what you'll be renting. There is also an 8-room bed-and-breakfast called The Pensione not far from the beach and the westernmost village green. Rates vary seasonally, lowest in winter, highest in summer. See their website for rates during the period you want to visit. Travel Instructions. By Air: Although there are regional airports in Fort Walton Beach (VPS), 30 minutes west, Pensacola Regional (PNS), 90 minutes west, the major gateway is Northwest Florida Beaches International Airport (ECP), roughly an hour's drive to the east in Panama City. Rental cars are available at all three. General Tourist Information. Visit the Beaches of South Walton Tourist Development Council website or contact them at 800-822-6877.